Just 9 cabins for a maximum group size of 18. Expedition itinerary deep into the forests. Forest walks led by trained naturalist guides. Tucano is an elegant Amazon riverboat with 3 decks and ample space for guests both inside and out. Tucano was built in 1997 in the style of the traditional Amazon riverboats and has beautiful woodwork throughout. The 9 cabins all have large windows offering views of the river and riverbanks. Each has an ensuite bathroom with shower, basin and toilet. The main salon on the middle deck is an elegant area, surrounded by large picture windows and with a large balcony where guests can sit, relax and watch their surroundings. Meals are taken in the salon. These are delicious and freshly prepared in the galley. The salon also acts as a library, housing a range of science and nature reference books as well as works of fiction. All indoor areas and cabins are air conditioned. The observation deck on the top deck has an open sun deck plus a canopy area providing shade and is a great place to enjoy a cool drink while watching for wildlife on the riverbanks. There is a swim deck on the lowest deck. A trip on the Tucano is different from other Amazon cruises. The owners are keen to put this forward as an 'expedition cruise' which means that you get the chance to explore far into the forest. You are likely to see wildlife that is normally well hidden to other visitors. This cruise is informative and active, with several excursions off the boat every day. Every morning you walk in the forest. But this need not be too strenuous for older travellers because when you go into the forest they divide the party into small groups, each with a private guide. Excursions are led by Tucano's resident naturalists and can be easy walks or moderately strenuous hikes. Alternatively guests are free to remain on the yacht whenever they wish. Location: The Tucano is located on the Amazon River, based in Manaus. Rooms: There are 9 cabins all with en-suite facilities. Most have individual beds and some have bunk beds. All cabins are air conditioned. They all have large windows. Activities: Exploring the rainforest in motor launches and on foot with expert naturalist guides, guided nocturnal walks, swimming in the river and visiting local settlers in the forest. There are also stops at and tours of towns on the route. Facilities: The Tucano has a spacious forward facing salon with a wide balcony. This room also serves as library and dining room. The observation deck is on the top deck. It has a large sun canopy providing shade an there is an uncovered area for sun seekers. There is a good electrical supply on board. Communication: There is no Wi-Fi internet access on Tucano. A cruise with the Tucano brings direct economic benefit to local communities, and also impacts in terms of environmental education in the region. "No hot water (and no-one warned us before we tried to take a shower!) but otherwise excellent Overall it was better than expected The staff really tried hard to accomodate the vegetarian member of our party, especially given the limited catering facilities available"
"Allowing for the fact that this is a smallish boat and therefore somewhat cramped we enjoyed our time on board. Our room was probably one of the smallest and we had bunk beds, but it was comfortable and clean and the the air conditioning was excellent. The food was very good. The only negative comment we have is about the bathroom. Unfortunately, there was an almost constant drip of water through to ceiling which pooled on the floor and covered the toilet seat and cover. We did point this out but I think they were unable to make any repair. We were told the water was coming from the air con unit in the dinning room which was immediately above us. SUPPLIER RESPONSE: We did note that there was a condensation drip in the bathroom of Cabin 1 and we put a carpenter on this problem. It would have been very difficult to make a repair while the boat was underway given that the condensation drain was within a built in overhead panel which would have required a very extensive dismantling. But the repair was made and lets hope that the difficulty will not return." "A beautifully made wooden boat with comfortable cabins laid out in dark wood. Most of the on-board time was spent on the top observation deck looking out for birds, monkeys and dolphins, though. Meals were excellent without fail, and the whole crew generated a happy atmosphere. We had expected to meet quite a few other tour boats on this cruise, and were amazed to find a virtual absence of ANY other biggish boats. This really emphasised the remote, pristine and vast character of Amazonia in the best possible way. Comment from the Tucano: We are pleased that Mike enjoyed the experience. We might add that in addition to the time spent observing from the top deck of the vessel, there are four or more excurisons off the vessel every day into the forest, each of which is 2-3 hours in duration. 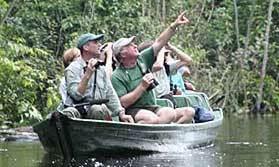 We excurison by launch and also on foot looking for the fascinating creatures of the forest." "Cabin was fine with room for the cases under the beds. Excellent catering provided you\'re not late. Very good trips well explained by guides. " "Very nice. Only four people (including us) on the boat which meant no strain on logistics or space but no reason to believe standards would drop with a full boat. Crew were all very friendly, kind and helpful. Food was good with plenty of choice and lots of local ingredients and flavours"